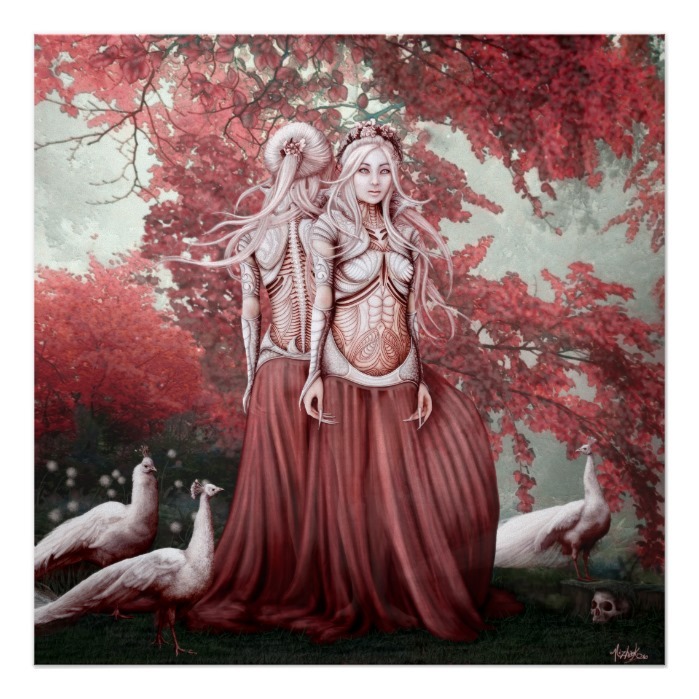 A beautiful, haunting, mesmerizing, surreal, digital art painting by Kate Dawidziak, featuring two witches standing back to back, under a canopy of red leaved tree, accompanied by three white peacocks and a skull lying on the ground. Titled 'Vrăjitoarele din Hoia Baciu' or 'Witches of Hoia Baciu', an eerie, beautiful painting based on the Hoia-Baciu forest situated near Cluj-Napoca, Romania - known as the world’s most haunted forest. A beautiful work of art for your walls. You may have the print framed while ordering. Makes a great gift for friends and family who are into ghosts, paranormal, witches, and haunted places.